Home Resource Two Books Updated for Swift 4.2 and iOS 12: Realm and RxSwift! Two Books Updated for Swift 4.2 and iOS 12: Realm and RxSwift! Happy Friday! It’s a great day for a book release to give you some great weekend reading! We’re happy to announce that we’re now on the Second Edition of Realm: Building Modern Swift Apps with Realm Database and Third Edition of RxSwift: Reactive Programming with Swift — fully updated for Swift 4.2, iOS 12 and Xcode 10. Both books will take your Swift skills to the next level as you move through key concepts of the Realm database and reactive programming. This book is for beginner iOS developers who want to learn how to build modern Swift apps with the persistence and synchronization of Realm Database and Realm Cloud. In this chapter, you’ll extend the Realm class with your own functionality to make use of Objective-C’s dynamic nature and key-value coding. Then, you’ll go deeper into Realm’s SDK than ever before and use some of the types that give you direct access to the Core’s API. In building the project for this chapter, you’ll focus on cascading deletes. A database server typically includes features that go beyond CRUD operations and common functionality like indexes and advanced queries. Embedded databases like Realm, on the other hand, have to make a tough choice between being feature rich and being performant. One of Realm’s core goals is to be extremely fast; this means many features aren’t available in Realm compared to other database types. One of those features is cascading deletes. You’ll learn how to leverage them to allow the schema to contain a set of rules used to delete related records when you explicitly delete their root record. 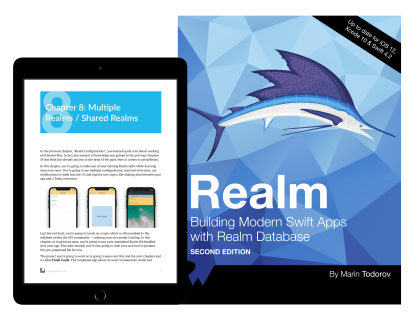 This will be a free update for existing Realm: Building Modern Swift Apps with Realm Database digital edition customers — our way of thanking you for purchasing the book! Don’t own Realm: Building Modern Swift Apps with Realm Database yet? Keep reading for details to get your own copy! This book is for advanced iOS developers who want to learn how to use RxSwift to create complex, reactive applications on iOS. The RxSwift framework offers a large choice of operators, which can be overwhelming for beginners. But when you start using a lot of Rx functionality in your applications, you may quickly find yourself needing even more operators to solve cases not covered by the core framework. While creating your own operators is easy, you may want to rely on existing, well-tested code that guarantees you’ll always get the results you want. You’ll learn about some of them in this chapter. unwrap: One of the most common needs of Swift developers is the ability to convert optional to non-optional streams. This chapter will start you on your journey to solving this issue! distinct: When processing a sequence of values, it can be useful to only see each element once. Realm can help you do that, which is explained in this chapter. filterMap: A combination of filter() and map(), filterMap(_:) allows you to single-handedly filter items and map them to a different type — this chapter will help you do this in a very nice and expressive way. withUnretained: Resource management is always a major concern for developers. RxSwiftExt has an interesting take on it with an observable sequence that can stop when an object is no longer in use. You’ll learn how to leverage it in this chapter. In addition to the above, you’ll learn about the mapAt operator. This comes handy when working with sequences of JSON data! 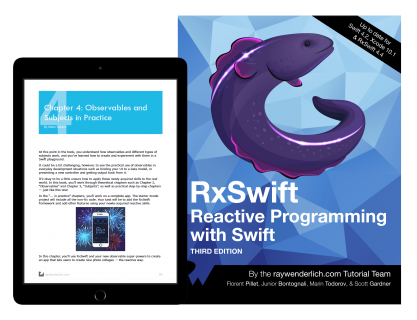 This will be a free update for existing RxSwift: Reactive Programming with Swift digital edition customers. Don’t own RxSwift: Reactive Programming with Swift yet? You can find the details you need below to get your own copy. Realm: Building Modern Swift Apps with Realm Database, Second Edition and RxSwift: Reactive Programming with Swift, Third Edition are 100% complete, fully updated for Swift 4.2 and iOS 12. We hope you enjoy these great books! You can now rate the books right on their store pages. We’d love to know what you think of the books, so feel free to rate them and leave comments in the discussion forum below! These books are available in paperback, purchasable through Amazon. You can find a convenient link right on the store page for both RxSwift and Realm so that you can get these beautiful books on your bookshelf at home!